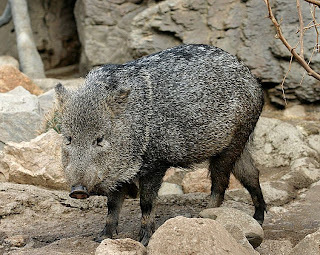 Animal Wildlife | Collared Peccary | The collared peccary, also referred to as a Javelina or musk-hog, may resemble a pig, however, peccaries belong to a completely different family than true pigs. 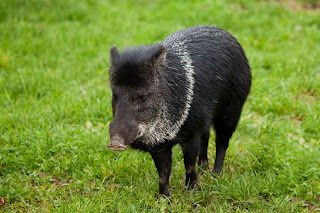 The collared peccary belongs to the Tayassuidae family while pigs belong to the Suidae family. The reasoning behind this separation is a result of anatomical differences between the animals. Collared peccaries are a widespread animal which range from South-western United States through Central America and into South America. In South and Central America the collared peccary prefers to live in the tropical rainforests. Although, in North America they can be found roaming the deserts, which are particularly rich with prickly pears. The javelina is definitely pig-like in appearance, however, they tend to be smaller than pigs with longer, thinner legs. As well, the collared peccary has a large head with a long snout and razor-sharp tusks which point towards the ground. Their coats are thick and bristly with a dark grey colour and a ring of white fur around their neck, which looks a lot like a collar. The collared peccary also has a very strong musk gland located on the top of their rump. In fact it is so strong that you will often smell this animal before you see it. 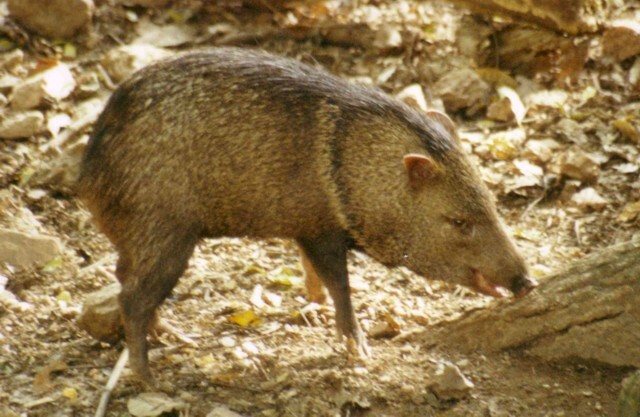 Collared peccaries are social animals which form bands generally ranging from 6 to 12 animals. This group of animals will do almost everything together from foraging to sleeping and eating. Only the old and sick don't band up since they prefer to die in on their own. These bands are usually lead by a dominant male with the rest of the pecking order determined by size. Due to the extremely hot temperatures in musk-hog's range, they tend to be most active during the cooler mornings and evenings. 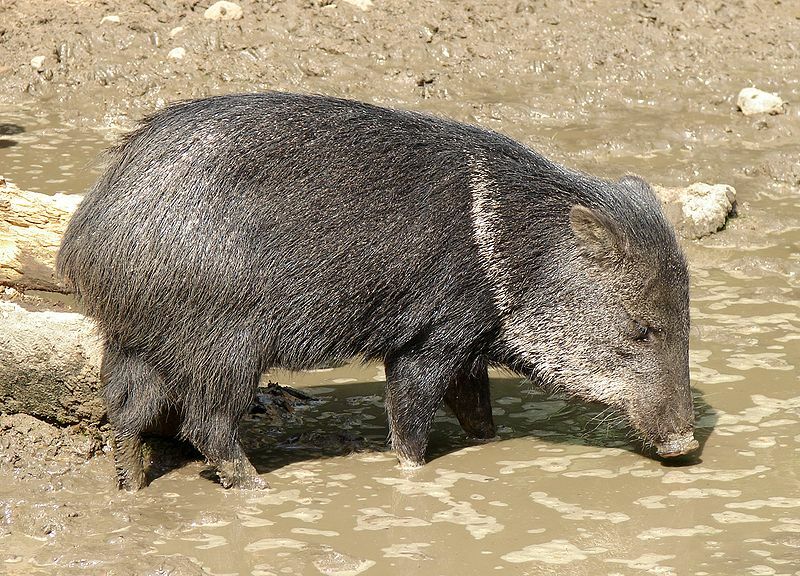 The rest of the day the peccaries will seek the shade or stay close to permanent watering holes since they are not able to cool themselves off by panting. 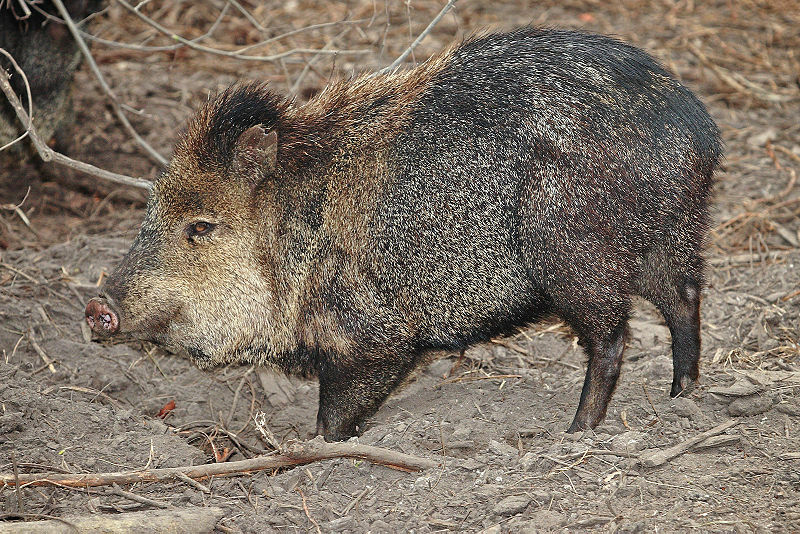 Peccaries mainly feed on berries, grass, roots, beans, nuts and cacti. In fact they rely very heavily on cacti such as the prickly pear since they have a very high water content. A good source of water is important in the drier climates. These animals will supplement their diet with animals such as insects and small lizards. Predators of this pig-like animal include coyotes, mountain lions and jaguars, although the young and weak may also be preyed upon by bobcats, ocelots and the boa constrictor. 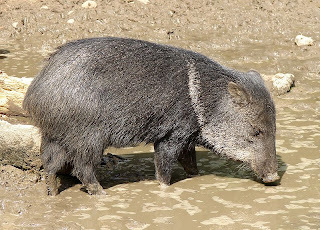 The sharp upper canines and large herd formations are some of the defence mechanisms used by peccaries to protect themselves. Females usually become mature around 8 to 14 months while the males are mature after 11 months. Breeding will occur all year long and is usually dependant upon the rain. During the wet and rainy years, more young tend to be born. The litter size of the peccary is between 1 and 4 young which have a gestation period of around 145 days. Although, their hides have been a source of economic income for humans for decades, their population seems to remain healthy. 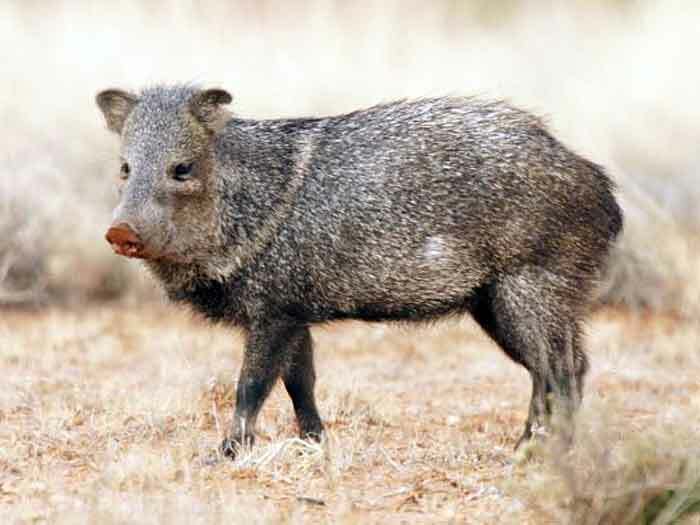 Luckily the collared peccary is widespread and fairly abundant which leads to a conservation status of least concern. 0 Response to "Collared Peccary"